I had heard that a crepe place had opened up on Convoy St and was instantly intrigued. There’s one in Poway, but it’s pretty expensive by my standards (which means I don’t want to pay more than $5 for something I can make at home). Crepe World is in the O’briens shopping center with Crab Hut and Yogurt World, next to a donut shop and where that sticker booth place used to be. It’s the same owners as Yogurt World, so don’t feel like you’re betraying one dessert stop for another. No guilt! 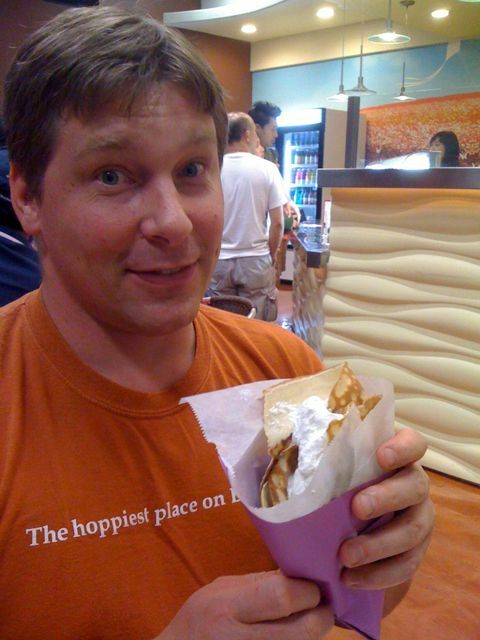 The crepes are huge and tasty, not expensive, and come with practically infinite options. You can get it plain, buttered, with Nutella or custard or ice cream, with fruit, with red beans, etc. The edges are crispy but the crepe itself has a slight chew. Granted, these are not French crepes; they are more like Japanese crepes. I can’t explain the difference except to compare it to Asian frozen yogurt vs. regular frozen yogurt. We got a nutella and banana crepe ($4) and a custard and strawberry crepe ($4). T’s crepe had more nutella than mine had custard but they were both good. We had issues eating them from the cone they were wrapped in, so we had to unwrap them and then eat them. No big deal. Yelp has given them pretty poor reviews and I’m not sure why. Maybe I’m not so picky when it comes to a cheap crepe that I don’t have to make?Maybe other people are okay with paying twice as much for a smaller Fench crepe? Whatever the reason, we liked our crepes and I’m glad we have a dessert option for when it’s too cold for frozen yogurt. You can even add mochi balls! 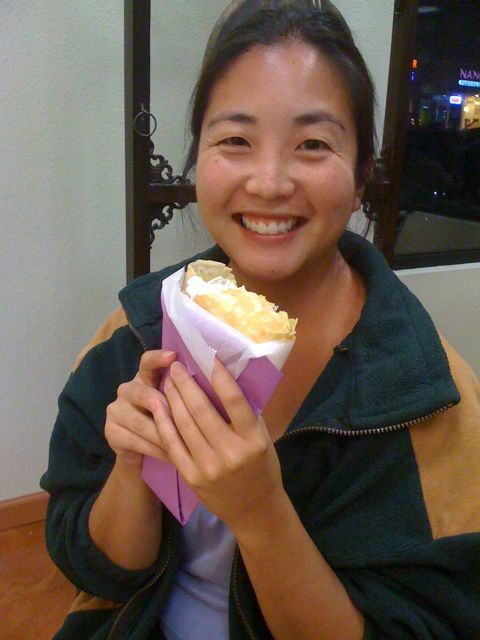 This entry was posted in restaurants and tagged cheap dessert, convoy, crepe, san diego. Bookmark the permalink.